Following our recent pond project we had lots of messes to clean up. Our patio was definitely not a wonderful destination two weeks ago but it has been transformed through a little hard work and creative thinking. We decided to remove everything from the patio and give it the springtime powerwash. My husband and I both love to powerwash because it makes so much impact for the amount of effort it takes. Our patio is made of two areas - part is under the roof line and part is open air. We've always had the wicker furniture under the roof but decided to switch the furniture this year to give us the best view of the pond from the comfortable seats. The eating table and glider are now closer to the kitchen door and fireplace. This works nicely too for ease of serving food. We've been enjoying our coffee out here in the mornings and the sunset/moonrise in the evenings. We've been amazed at the number of lightning bugs there are and the symphony of frogs is underway. It's funny how something as simple as switching the location of the furniture has extended our living space dramatically. This was completely my husband's idea and he was smart to think of it! How relaxing it must be to listen to the waterfall! It is an awesome space.You are lucky to look out on your pretty pond. Now you can relax and enjoy! Happy Memorial Day! A beautiful place to sit and enjoy long summer days, frog songs and running water in your lovely pong. What a wonderful space to spend time! Your pond is so pretty and with your new furniture arrangement I can imagine you spend lots of time there. I love sitting out on the patio enjoying flowers and watching the birds. Hope you had a blessed weekend! 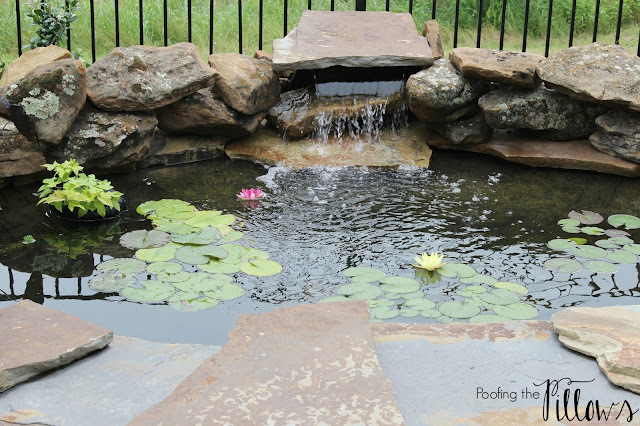 Your pond looks like it has always been there and by reading your post I can tell that you are really enjoying it. 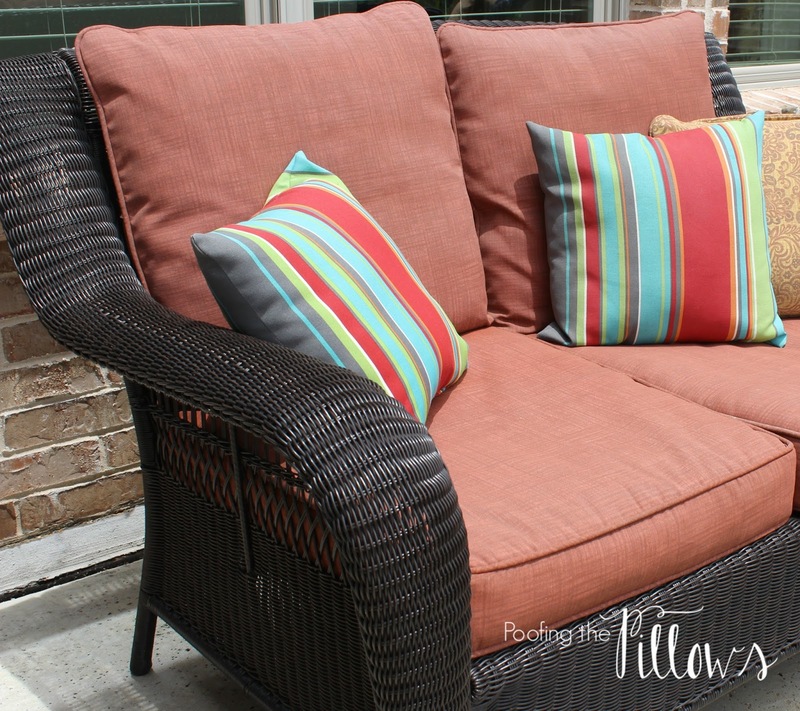 Your switch around with outdoor furniture looks great. Don't you just love it when a plan comes together?! Kudos to hubby for the lightbulb idea for furniture flip. I love your water feature, and the idea of really using the outdoor space to its max. Power washing can be a double edged sword when it comes to washing brick. My husband loves that clean look on brick (we both like it on concrete), but I enjoy the mossy texture of old brick, so ours is a struggle, especially when I know mortar gets compromised in the act. I saw my first lightning bug last night! They're just coming around our neck of the woods (or city, as the case may be). Here's to a great week and start of a new month. I'd love to join you at your patio and listen to your waterfall and see all those pretty water lilies that are flowering, Stacey! How sweet of your hubby to think of the change for your space, with moving the furniture. I have that same glider and just love it. It's where I always go to sit when I'm on my patio. I also have a table very similar to yours. I'll bet you had a nice Memorial Day at your house. I am so happy for you and that you are so pleased with your pond and outdoor living space. We just have to have those spaces living in our warm and dewy and Texas temps. Absolutely gorgeous! Yes, I would love very much to join you for a lemonade and enjoy the lovely view of the pond. I love your seating area, it looks great, and your husband sure had a great idea. Don't you just love how they surprise us every now and then with ideas! Enjoy the week……. I would LOVE to join you! Your patio is gorgeous and the view is beautiful and must sound so nice. I live for this time of year. We have been working on our garden area and plan to add a large brick patio to that area this year. I can't wait! We love sitting out there for dinner and the evening. Talking and watching the hummingbirds at the feeders. Such a pretty space! I LOVE your pond. How much fun for you to sit outside to relax and enjoy the view!!! Ahh this looks great and so inviting! The pond looks wonderful- I see the lily pads are blooming! I had too much shade and they'd never flower for me. Looks like you are set for summer! Hi Stacey, your extended living space to the patio is beautiful. How nice to listen to the waterfall and enjoy the pretty surroundings you created. How relaxing and beautiful. What a gorgeous extension of your home. The pond is so beautiful and I bet listening to the water fall is amazing and relaxing. I wish I lived closer to sit and enjoy your view out there. Looks like you are all set for a wonderful outdoor summer. The perfect, relaxing space!! I can picture many a days and nights out there enjoying the sounds and beauty of the sweet summertime! The power washer is fun isn't it?! Your patio is gorgeous! Now you can sit back relax and enjoy all the work you have done to create such a peaceful and beautiful place! We love powerwashing too. It makes such a big impact! Your outdoor area is lovely! Thanks for linking up to Dishing It! & Digging It! Isn't it lovely to be able to sit outside, I especially enjoy it in the evenings. I hope you aren't getting too many mosquitos! The waterfall must make a lovely sound to listen to as you sit out on the patio! Thank you for sharing over at Celebrate Your Story! I feel all peaceful and calm just gazing at your pictures. Perhaps it is time to go out and sit on the porch. So pretty! 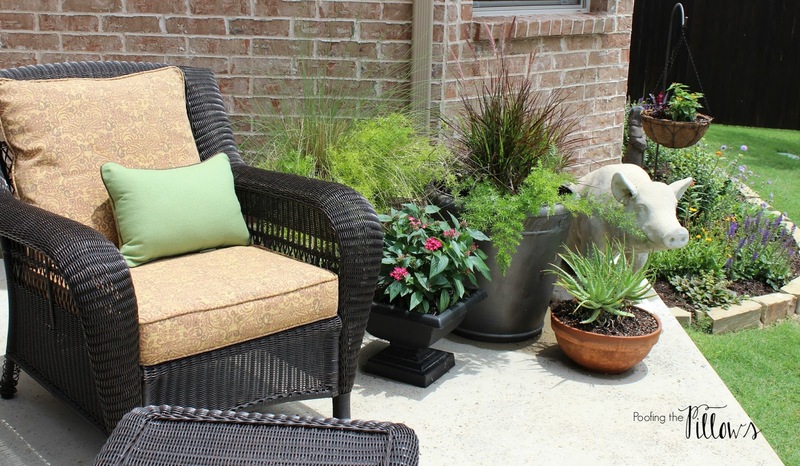 I think, especially in the south, our patios do tend to become an extension of our homes. We totally need to power wash too. It's been on a list on the fridge for weeks now and we keep putting it off. :) I need to scrub the outdoor rug that's out there too. Now that it's already so hot, I'm not looking forward to it. Lol! I bet you're really enjoying that pond. How nice to have your coffee out there in the mornings. We've had a lot of lightening bugs lately too. I love them! Everything looks just wonderful, beautiful and oh, so peaceful. I love the outdoors and it's important to have a slice of heaven outdoors! You've certainly created your slice! Your pond looks like it's been there for years. The water lilies and other plants add so much to the overall look and feel. 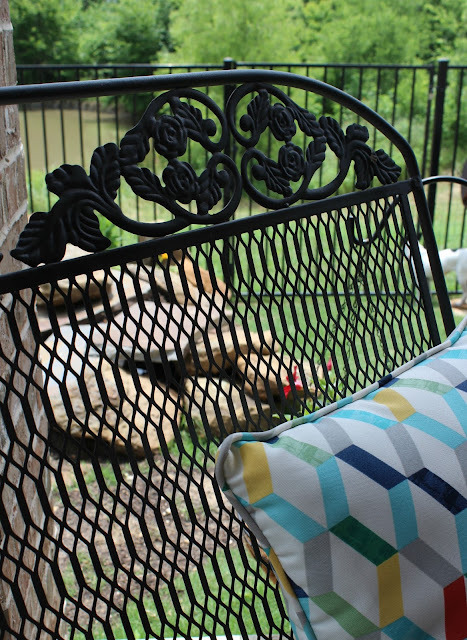 Sitting on your patio sounds like heaven to me. I can just hear the quiet of the evening interrupted only by the sounds of nature. It must be so relaxing gazing into your new pond at the beginning and end of the day! How gorgeous. I love what you have done with your patio. I read that the rains we had last spring have helped the lightening bug populations. I can't wait to see some in our yard. I'm so glad that you are enjoying your lovely deck. I love the lily pads in your pond! Everything looks so fresh and inviting ready for summer! Wow, that view is really outstanding. Your pond looks so great and I bet it's wonderful to sit on your pretty patio and just listen to the sounds of (almost) summer! Your patio looks so pretty and relaxing, Stacy. It must be delightful to enjoy your wonderful pond! I know you are loving you new living area. How relaxing. The pond is awesome! Everything looks gorgeous, Stacey. The pond is stunning and your choice of color is great. We used to have a fountain in Texas and I loved the sound of the water. So relaxing! Hope you enjoy your week! Everything looks amazing....beautiful outdoor spot. I'm so glad you're enjoying your gorgeous new pond! I love how your furniture arrangement let's you enjoy the view...and the company. Your hubby had a great idea! I think men are more spatial than women. My husband could not choose a paint color to save his life but he is a wiz at moving the furniture around and knowing what fits in a given space. Go figure. Your patio is always so beautiful...you have such great outdoor living!! Yes, I'd love to sit on your comfy patio and enjoy the view of your beautiful pond. Well done, Stacey! Oh Stacey, what a beautiful porch. I love how it turn out. How have you been?